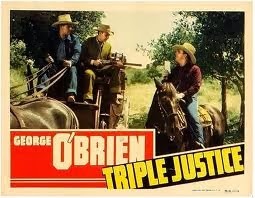 TRIPLE JUSTICE is a superior George O'Brien Western. It follows THE MARSHAL OF MESA CITY (1939) and LEGION OF THE LAWLESS (1940) as the concluding film in a three-film O'Brien Westerns set from the Warner Archive. I smiled with anticipation as TRIPLE JUSTICE began with the familiar beeping RKO logo, followed by a sharp-looking credits sequence which made clear that this would be yet another gorgeous O'Brien print from the Archive. This black and white movie, shot by J. Roy Hunt, looks terrific, and I'm so appreciative of the quality presentation a "B" Western like this receives from the Archive. The tale begins when Brad Henderson (O'Brien) arrives in town for the wedding of his best friend, Sheriff Bill Gregory (LeRoy Mason) to Susan (Peggy Shannon). Brad is caught up in a bank robbery and mistaken for one of the outlaws. Unfortunately Sheriff Gregory is shot by the robbers and unconscious for an extended period, so he's unable to identify Brad. 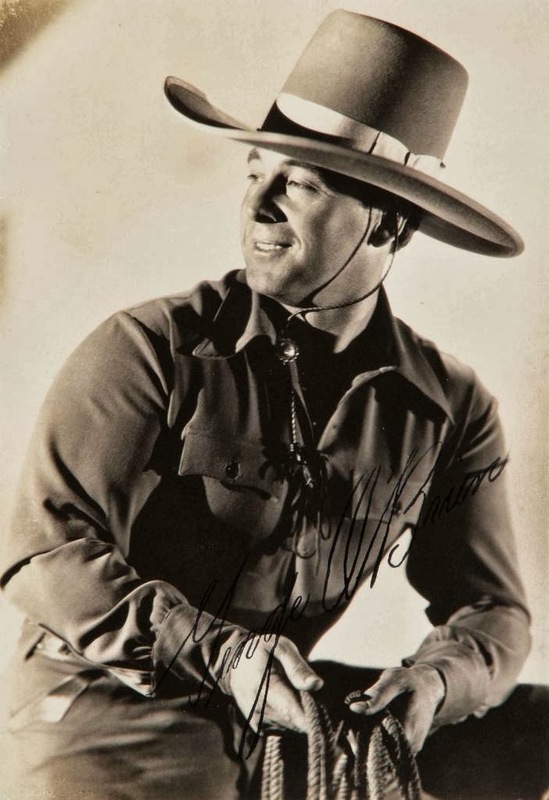 Unbeknownst to Brad, the sheriff's deputy, Al Reeves (Harry Woods), is in cahoots with the outlaws, which explains why he doesn't seem very interested in seeing that Brad's name is cleared. Brad has no choice but to escape and try to clear his name. He sets out after each of the three outlaws he knows by sight -- hence the movie's title. One of the outlaws (Malcolm McTaggart) just happens to have a charming sister, Lorna (Virginia Vale), who is so taken with the handsome "outlaw" she finds sleeping in her barn that she can't bring herself to turn him in. TRIPLE JUSTICE squeezes a lot of story into its 66-minute running time, along with excellent location shooting and several musical numbers. Some of the movie was shot in Lone Pine, but the film's most striking sequence finds Brad trailing one of the outlaws (Paul Fix) across Death Valley. It's quite a memorable sequence. The second half of the film is very musical, with the Lindeman Sisters as pretty senoritas singing two songs at a hacienda south of the border. Meanwhile O'Brien listens as Virginia Vale sings "Lonely Rio," cowritten by Ray Whitley and Fred Rose; although he's not in TRIPLE JUSTICE, Whitley was one of O'Brien's regular sidekicks at RKO and also starred with Vale in a series of musical shorts. Whitley's most famous composition was "Back in the Saddle Again." This was O'Brien's last of six films with Vale and his last Western under contract to RKO. In Boyd Magers' WESTERNS WOMEN, Virginia Vale mused, "I have no real information, but I think RKO knew maybe halfway through this series of six that they were going to drop George. After all, he was 40 or 41 years old. He still had a wonderful physique, but he was no longer really slim and young, the way most of the cowboy stars were at that time. That might be one reason why, at the end of the six pictures, George and I got married in TRIPLE JUSTICE. You know, closing it out." Vale also said that O'Brien's longtime director, David Howard, "was a very kind man. Very patient...He was a very soft-spoken man. In fact, I don't remember anybody who was connected with any of the Westerns who wasn't soft-spoken. Everybody was just polite." She said of Harry Woods, who plays the chief villain, "What a meanie he would be, always after the girl or after the mine or after something. Very good." More of Vale's thoughts on her experiences working with George O'Brien are included in my review of BULLET CODE (1940). I highly recommend Magers' book, which has many other interesting interviews. O'Brien has a hilarious scene with Hank Worden, who often turned up in bit roles in O'Brien's Westerns. The cast also includes Glenn Strange, Jean Del Val, Wilfred Lucas, and Robert McKenzie. 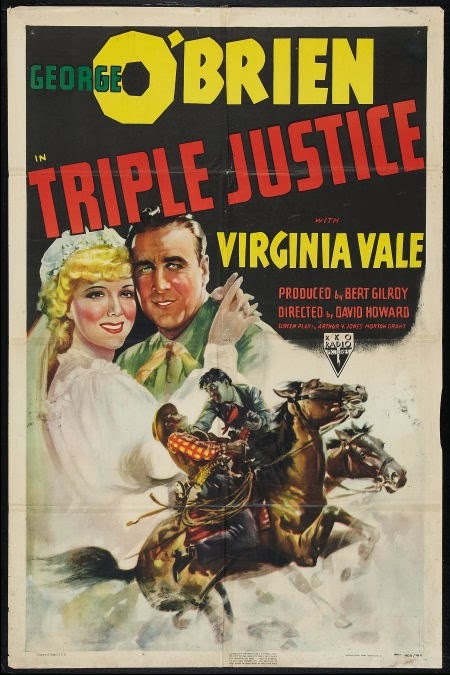 TRIPLE JUSTICE would be O'Brien's last film until after World War II, other than providing a voice for the Naval film December 7th (1943). O'Brien, who had served in the Navy during WWI, re-enlisted and was a decorated officer during WWII. After the war he continued to focus on his Naval career, serving during Korea and continuing in the Naval Reserves until the '60s. He appeared in just a handful of post-WWII films including MY WILD IRISH ROSE (1947) and John Ford's FORT APACHE (1948), SHE WORE A YELLOW RIBBON (1949), and CHEYENNE AUTUMN (1964). 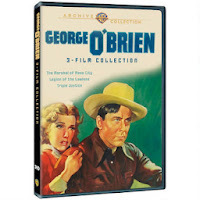 Previous reviews of George O'Brien "B" Westerns: THE RENEGADE RANGER (1938), GUN LAW (1938), PAINTED DESERT (1938), BORDER G-MAN (1938), ARIZONA LEGION (1939), TIMBER STAMPEDE (1939), THE FIGHTING GRINGO (1939), THE MARSHAL OF MESA CITY (1939), LEGION OF THE LAWLESS (1940), and BULLET CODE (1940). A movie and a book recommendation. You're keeping me occupied. I have to admit that I haven't seen Triple Justice but I am more than certain my father has, probably half a dozen times. I love the posters that you've included. There were so many of Vale and O'Brien at the Gene Autry that I visited and posted pics of. I wish I had the patience to watch more Westerns and especially musicals. Thanks for your honest and fun review. Thanks, Caftan Woman, since you're a Westerns fan like I am I really think you'll like both! Page, so nice of you to stop by. I haven't been to the Autry for a couple of years, I wonder if I would find O'Brien-Vale posters currently on display were I to visit again? I'd sure like to see them. If you'd like to share a link to your post here please feel free!